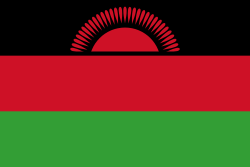 The flag of Malawi was adopted on 6 July 1964. It has a horizontal bands of black, red, and green, with a red rising sun centred on the black stripe. This page was last changed on 19 January 2018, at 21:33.